Oil prices were stable on Tuesday, supported by hopes that talks in Beijing between United States and Chinese officials might defuse trade disputes between the world’s biggest economies. The Organisation of Petroleum Exporting Countries (OPEC)-led supply cuts also tightened the markets. International Brent crude futures LCOc1 were at $57.42 per barrel at 0742 GMT, up 9 cents, or 0.2 per cent from their last close. U.S. West Texas Intermediate (WTI) crude oil futures CLc1 were at $48.56 per barrel, up 4 cents, or 0.1 per cent. U.S. Commerce Secretary Wilbur Ross said on Monday that Beijing and Washington could reach a trade deal that “we can live with”. Dozens of officials from China and the United States held talks in a bid to end a trade spat that has roiled global markets since last year. “We remain concerned about the world’s most important bilateral relationship,” political risk consultancy Eurasia Group said in its 2019 outlook. ”(And) rising nationalist sentiment makes it unlikely that Beijing will ignore U.S. provocations,” Eurasia Group said. There is also concern that a worldwide economic slowdown would dent fuel consumption. As a result, the hedge fund industry has cut back its bullish positions in crude futures. S&P Global Ratings said it had lowered its average oil price forecasts for 2019 by $10 per barrel to $55 and $50 per barrel, respectively. Looking at oil supplies, 2019 crude prices have been supported by supply cuts from a group of producers around the Middle East-dominated OPEC as well as non-OPEC member Russia. 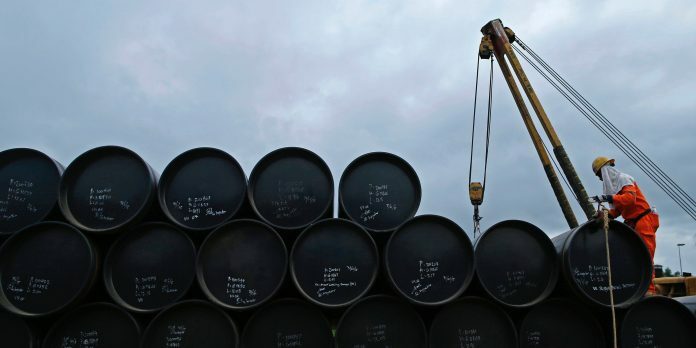 “Crude oil prices have benefited from OPEC production cuts and steadying equities markets,” said Mithun Fernando, investment analyst at Australia’s Rivkin Securities. Looming over the OPEC-led cuts, however, is a surge in U.S. oil supply, driven by a steep rise in onshore shale oil drilling and production. As a result, U.S. crude oil production C-OUT-T-EIA rose by a whopping 2 million barrels per day (bpd) last year to a world record 11.7 million bpd.